Let's recap the current smartphone/tablet SoC landscape. Everything shipping today is built on a 4x-nm process, built either at Global Foundries, Samsung, TSMC or UMC. Next year we'll see a move to 28nm (bringing better performance and power characteristics) but between now and the end of 2012 there will be a myriad of designs available on the market. The key is this: other than TI's OMAP 5 in the second half of 2012 and Qualcomm's Krait, no one else has announced plans to release a new microarchitecture in the near term. Furthermore, if we only look at the first half of next year, Qualcomm is the only company that's focused on significantly improving per-core performance through a new architecture. Everyone else is either scaling up in core count (NVIDIA) or clock speeds. As we've seen in the PC industry however, generational performance gaps are hard to overcome - even with more cores or frequency. Qualcomm has an ARM architecture license enabling it to build its own custom micro architectures that implement the ARM instruction set. This is similar to how AMD has an x86 license but designs its own chips rather than just producing clones of Intel processors. Qualcomm remains the only active player in the smartphone/tablet space that uses its architecture license to put out custom designs. The benefit to a custom design is typically better power and performance characteristics compared to the more easily synthesizable designs you get directly from ARM. The downside is development time and costs go up tremendously. Scorpion was Qualcomm's first Snapdragon CPU architecture. At a high level, it looked very much like an optimized ARM Cortex A8 design although the two had nothing in common outside of instruction set. Scorpion was a dual-issue, in-order architecture that eventually scaled to dual-core and 1.5GHz variants. Scorpion was pretty much the CPU architecture of choice in the 2009 - 2010 timeframe. Throughout 2011 however, Qualcomm has been very quiet as dual Cortex A9 designs from NVIDIA, Samsung and TI have surpassed it in terms of performance. Going into 2012, Qualcomm is set for a return to glory as it will be the first to deliver a brand new microprocessor architecture and the first to ship 28nm SoCs in volume. Qualcomm's next-generation SoCs will also be the first to integrate an LTE modem on-die, which should enable LTE on nearly all high-end devices at much better power levels than current multi-chip 4x-nm solutions. Today we're able to talk a bit about the architecture details and performance expectations of Qualcomm's next-generation SoC due out in the first half of 2012. 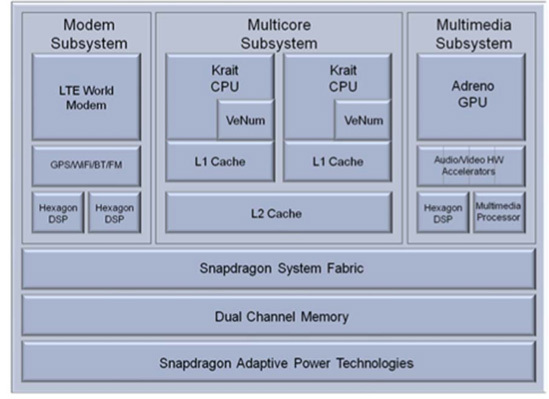 The Krait processor is the heart of Qualcomm's second generation Snapdragon and it's the core of all Snapdragon S4 SoCs. Krait takes the aging base of Scorpion and gives it a much needed dose of adrenaline. Krait's front end is significantly wider. The architecture can fetch and decode three instructions per clock. The decoders are equally capable of decoding any ARMv7-A instructions. The wider front end is a significant improvement over the 2-wide Scorpion core. It alone will be responsible for a tangible increase in IPC. The execution back-end receives a similar expansion. Whereas the original Scorpion core only had three ports to its execution units, Krait increases that to seven. Krait can issue up to four instructions in parallel. The additional execution ports simply help prevent any artificial constraints on ILP. This is another area where Krait will be able to see significant IPC gains. Krait's fetch and decode stages are obviously in-order, but the back-end is entirely out-of-order. Qualcomm claims that any instruction can be executed out of order, assuming that doing so doesn't create any new hazards. Instructions are retired in order. 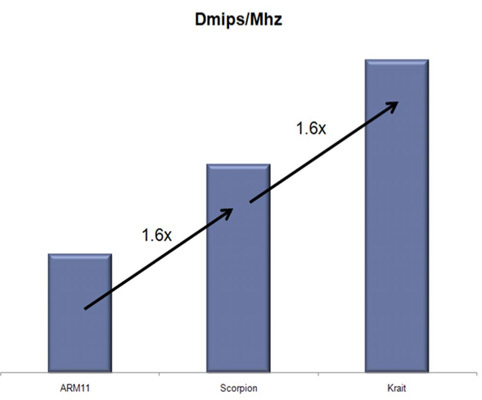 Qualcomm lengthened Krait's integer pipeline slightly from 10 stages in Scorpion to 11 stages in Krait. Load/store operations tack on another two cycles and instructions that go through the Neon/VFP path further lengthen the pipe. ARM's Cortex A15 design by comparison features a 15-stage integer pipeline. Qualcomm's design does contain more custom logic than ARM's stock A15, which has typically given it a clock speed advantage. The A15's deeper pipeline should give it a clock speed advantage as well. Whether the two effectively cancel each other out remains to be seen. Krait has been upgraded to support the new virtualization instructions added in Cortex A15. Also like the A15, Krait enables LPAE for 40-bit memory addressing. At a high-level Qualcomm has built a 3-wide, out-of-order engine that feels very much like a modern version of Intel's old P6. Whereas designs from the A8 generation looked like modern Pentiums, Krait takes us into the era of the Pentium II. Note that courtesy of the wider front-end and OoO execution engine, Krait should be a higher performance architecture than Intel's Atom. That's right, you'll be able to get better performance than some of the very first Centrino notebooks in your smartphones come 2012. At 3.3, Krait should be around 30% faster than a Cortex A9 running at the same frequency. At launch Krait will run 25% faster than most A9s on the market today, a gap that will only grow as Qualcomm introduces subsequent versions of the core. It's not unreasonable to expect a 30 - 50% gain in performance over existing smartphone designs. ARM hasn't published DMIPS/MHz numbers for the Cortex A15, although rumors place its performance around 3.5 DMIPS/MHz. ARM's NEON instruction set is handled by a dedicated unit in all of its designs. Krait is no different. Qualcomm calls its NEON engine VeNum and has increased its issue capabilities by 50%. Whereas Scorpion could only issue two NEON instructions in parallel, Krait can do three. Qualcomm's NEON data paths are still 128-bits wide. Update: Qualcomm published its whitepaper on the Snapdragon S4. Check it out here. 1) I wasn't aware that Microsoft released DirectX 9.3. Perhaps you meant 9.0c or 9.1? 2) Why is nVidia still using a single LPDDR2 channel when everyone else has gone to dual channel memory? Re: DX 9.3, you beat me to it. It's actually more complex than that. When it comes to programming for Direct3D11, there are a number of different GPU feature level targets. The idea is that developers will write their application in DX11, and then have customized render backends to target each feature level they want to hit. As it stands there are 6 feature levels: 11, 10_1, 10, 9_3, 9_2, and 9_1. Unfortunately everyone has been lax in their naming standards; DirectX and Direct3D often get thrown around interchangeably, as do periods and underscores in the feature levels (since prior to D3D 11, we'd simply refer to the version of D3D). This is how you end up with DirectX 9.3 and all permutations thereof. The article has been corrected to be more technically accurate to clear this up. Microsoft made such a mess out of its DirectX nomenclature in the DX9 timeframe that the rest of the industry started to ignore it and invent their own. Hardly anybody even bothers to distinguish between Direct3D and DirectX anymore...they're used interchangeably, even though the former is a subset of the latter. Although Scorpion featured a dual-channel LPDDR2 memory controller, in a PoP configuration only one channel was available to any stacked DRAM. In order to get access to both 32-bit memory channels the OEM had to implement a DRAM on-package as well as an external DRAM on the PCB. Memory requests could be interleaved between the two DRAM, however Qualcomm seemed to prefer load balancing between the two with CPU/GPU accesses being directed to the lower latency PoP DRAM. Very few OEMs seemed to populate both channels and thus Scorpion based designs were effectively single-channel offerings. I can tell you with a modicum of confidence that this is true, at least partially. Anyway unlike what the article says, the MSM8x60 indeed only has single-channel 32-bit LPDDR2. However there's a twist: Qualcomm offers it in a PoP (Package-on-Package) configuration at up to 266MHz or an 'ISM' (i.e. SiP or System-in-Package) at up to 333MHz. I wouldn't be surprised if many OEMs used the PoP for cost reasons. This information does come from Qualcomm, although the odd PoP + external DRAM configuration (that no one seems to use) basically means that MSM8x60 is a single-channel architecture (which is why I starred it in the table above). I will ask Qualcomm once more for confirmation that this applies to MSM8x60 as well as the older single core variants.